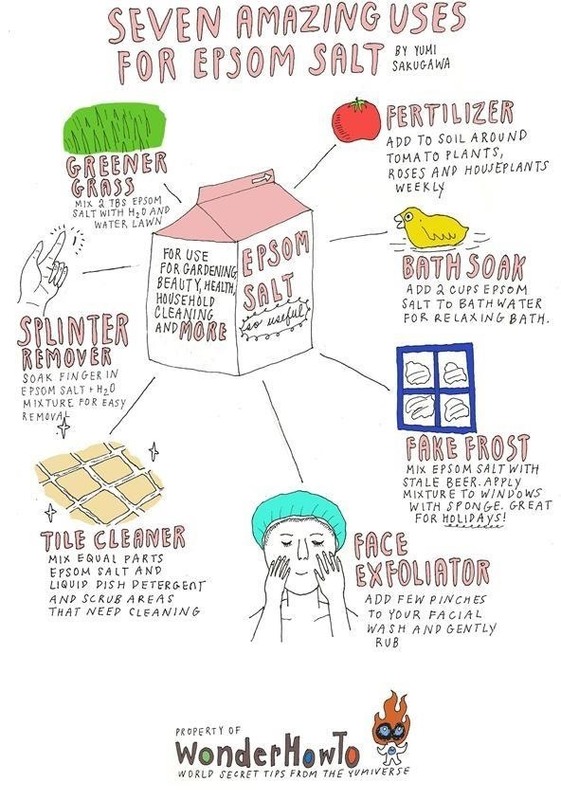 If you've never had a reason to keep some Epsom salt in your home, I'm about to give you seven good ones, some that will surely surprise you. The magical ingredient in Epsom salt is the mineral magnesium sulfate, which naturally sedates your nervous system and draw toxins out of the body if applied to swollen muscles. So the next time you want to give yourself a truly luxurious spa treatment without the price tag, simply add a cup of Epsom salt to your next hot bath. But that's not all—keep an Epsom salt carton handy for your next gardening project, household cleaning session, or Christmas party when you want to add a fake snow-frost effect to your windows for some extra holiday cheer. It's also great for removing painful splinters and making grass greener. Magical, right? You can pick up Epsom salt in drugstores or online. Epson salts will make your doll house ceilings look like blowed ceilings. On wet paint sprinkle Epson salts.